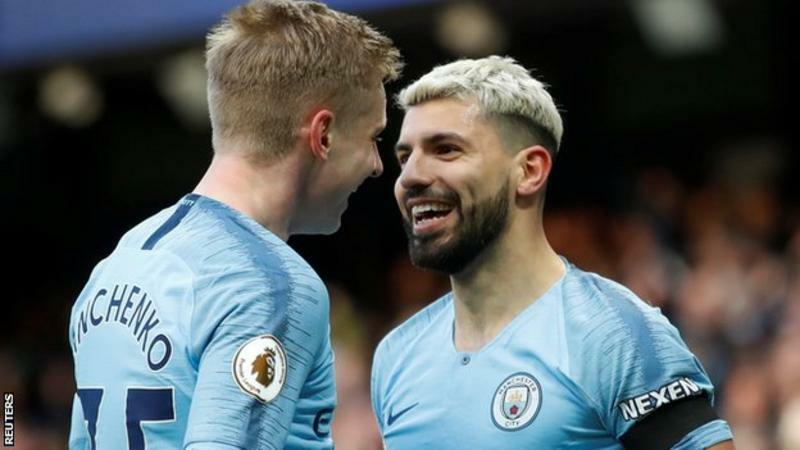 Sergio Aguero was Manchester City's hat-trick hero again as they returned to the top of the Premier League in scintillating style by outclassing Chelsea at Etihad Stadium. Liverpool's win against Bournemouth meant Pep Guardiola's side needed victory to return to the summit, albeit having played one game more. The rout started after four minutes when Chelsea were caught napping by Kevin De Bruyne's quick free-kick which left Raheem Sterling to fire in at the far post before Aguero, who had already missed an open goal, curled a magnificent right-foot finish past the stretching Kepa Arrizabalaga from 25 yards. 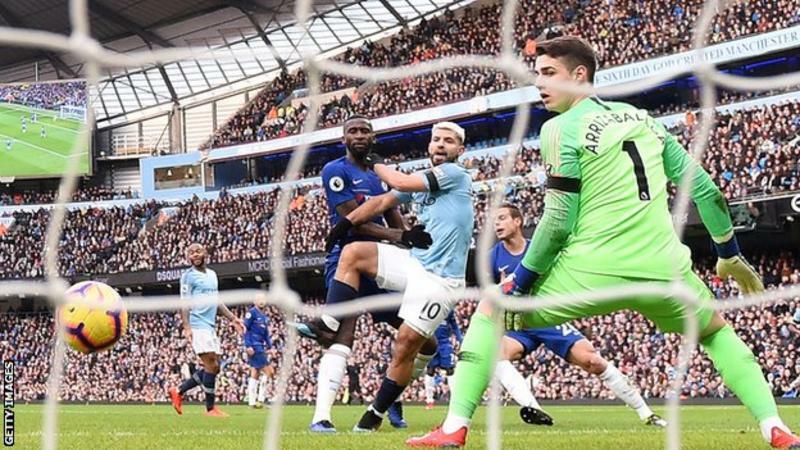 Chelsea's embarrassment was symbolised by Ross Barkley's inexplicable header straight to the feet of Aguero to poach his second and Ilkay Gundogan capped that early blitz with a low drive. Aguero completed his hat-trick from the penalty spot after 56 minutes following Cesar Azpilicueta's foul on Sterling, his 15th treble for City and a record-equalling 11th in the Premier League, an honour he shares with Alan Shearer. It was also his second in successive home games after his hat-trick in the 3-1 win against Arsenal. Sterling then piled on the agony for Chelsea with the sixth, turned in from six yards after David Silva's threaded pass released Oleksandr Zinchenko down the left. If Liverpool answered questions with their win over Bournemouth, City's response here - and in the last week - has been even more emphatic. 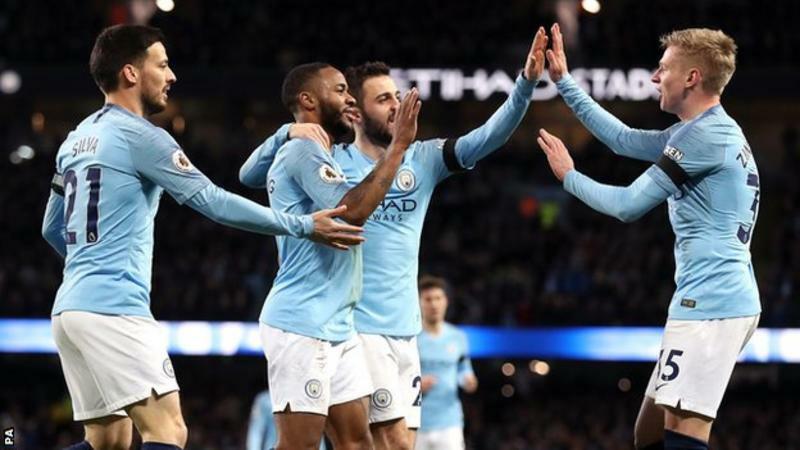 Guardiola's reigning champions faced a key week after their shock loss at Newcastle United with potentially hazardous home games against Arsenal and Chelsea, and a re-arranged trip to Everton. Sarri's approach has not carried Chelsea forward in recent weeks and the concern for him will be that owner Roman Abramovich will not like the look of this performance or the margin of defeat - and perhaps more significantly the fact they are now sixth and in danger of not making the top four and Champions League qualification. Chelsea's performance was characterised by the defensive mess and complete switch off for the opening goal and the hapless Barkley's header straight to Aguero for City's third. N'Golo Kante is wasted anywhere other than as arguably the world's finest holding midfielder while Jorginho (who ended up choosing Chelsea rather than City) is a player whose influence decreases by the week. Eden Hazard was tireless and Gonzalo Higuain was willing to shoot on sight - but they were dreadfully served in a Chelsea performance which was a complete mess. Manchester City manager Pep Guardiola: "To score six against Chelsea and the way we played, we had so much attention. We did it, it's an incredible compliment to the players, they are outstanding. "We spoke this morning, we trained set pieces, trained some movements and I never thought we would score this amount of goals." Chelsea defender Cesar Azpilicueta: "It is one of the worst nights in my career. It is difficult to explain what happened. "The first five or six minutes went well but that is not enough. We are conceding a lot of goals and we cannot accept that. Chelsea boss Maurizio Sarri: "My feeling this week was really good. It was good during training and the technical meeting and the warm-up. The goal after three minutes made it very difficult to play against these opponents, who played fantastic football. "The motivation today was good. We were not able to stay in the match and react later." Sergio Aguero has scored eight Premier League goals for Man City in 2019 - double that of any other player in the competition and more than 11 other Premier League clubs have managed, including Chelsea (seven).